Seminars have always been the USP of TrafficInfraTech and ParkingInfraTech Expos. This year was no different. The topmost policymakers and who’s who of the traffic sector gathered for some serious discussions on various burning issues in the traffic/ transport industry. The inaugural day saw none other than Yudhvir Singh Malik, Secretary, Ministry of Road Transport and Highways deliver his Chief Guest’s Address on ‘Smart Priorities and Solutions for Roads’. Anil Srivastava, Advisor (Infrastructure Connectivity) to NITI Aayog gave a Special Address on ‘National Vision & Policy Needs’ The panelists that came on three days were a ‘perfect combination of top ranking government officials, experts on the subjects, senior enforcement officers and technology providers’, said the delegates in one voice. And the ‘topics covered everything we wanted to know about’, they added. 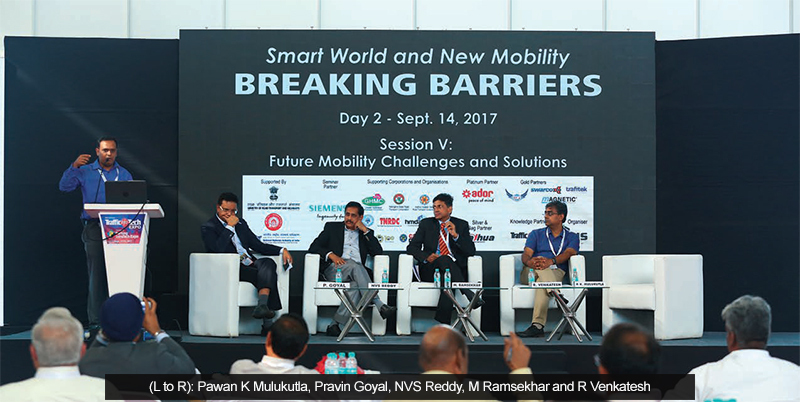 The panel discussion on ‘Digital Innovation for Mobility’ gave the three-day conference and the Expo theme a perfect start. Akhilesh Srivastava, CGM (IT) & COO-IHMCL, National Highways Authority of India and Michael Hirsh, Regional Director – India, Mobileye Vision Technologies made Special presentations. 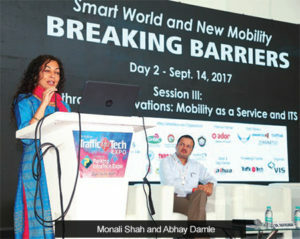 Monali Shah, Director, Intelligent Transportation, HERE Technologies, Chicago came specially to give the keynote address of the second session on the first day of the show. She spoke on ‘From Big Data to Information to Intelligence’. Kevin Martin of DataCorp Traffic, Germany (Transport Data Collection), in his address, spoke on ‘An introduction to Transport Data Collection’, while ‘Urban Traffic Control: Using adaptive techniques to improve traffic conditions in India’s Cities’ was the subject Ian Mayhew, Head – Consultancy services, Siemens UK spoke on ‘Predictive Analytics in Intelligent Transport System’. On the second day, Abhay Damle, Joint Secretary (Transport), MoRTH gave an interesting Special Address on ‘Personalised Transport to Shared Mobility’. Abbas Ravat, Director – Product Marketing and Smart City Alliances, KPIT Technologies gave a presentation. 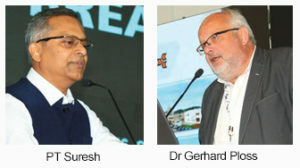 Importance of MaaS emphasized upon by speakers: Many speakers at the seminars laid emphasis on Mobility as a Service (MaaS), driving home the point that bundling all the packages together allows the passenger to access all transport networks with one App, making it convenient for him to travel. Jaspal Singh, Head of UITP India’s presentataion on ‘IMove Project in Europe – MaaS Pilot’ was very well received. “MaaS will bundle all packages together and the stakeholder will get everything together instead of buying separate tickets for buses, Metro, etc. Likewise, all the factors can be, and will be, combined under MaaS which is very disruptive. Any Transport network can be accessed with one App or Model under it, he said. Nikhil Agarwal, Co-Founder & CEO, Zophop spoke on ‘MaaS a reality in India? Sooner than you think’. This session too felt that people do not use available Public Transport mode because of inefficiency or unavailability. MaaS could change all that. Dr Rajesh Krishnan, CEO, ITS Planners and Engineers Pvt Ltd, spoke on the new technologies in ITS, and Dr Ravikumar, Joint Director – Intelligent Transportation and Networking Section (ITNS), Centre for Development of Advanced Computing (C-DAC) spoke on ‘Future of Mobility – Intelligent Transportation System to Intelligent Transportation Service’. Sonal Ahuja, Regional Director, PTV MENA Region DMCC (‘New Mobility Options integrating transport modes’) and Dr Gerhard Ploss, Head International & Business Development, Swarco Traffic Holding GmbH (‘Vehicle-to-infrastructure communication as a key element for Smart Cities’) also spoke.